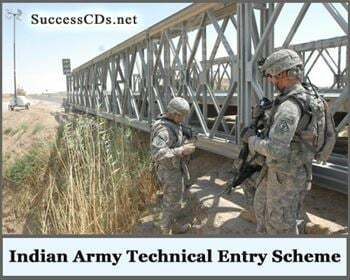 Indian Army TES 2019 - Technical Entry Scheme Army 2019 Apply Online! Indian Army TES 2019, Technical Entry Scheme Army 2019 - Indian Army invites applications from 10+2 exam pass candidates for the Technical Entry Scheme (TES) 41 Course July 2019 for the Grant of Permanent Commission.Eligible and Interested male candidates can apply online from 29th October 2018 to 27th November 2018. Other details like age limit, educational qualification, selection process and how to apply are given below. On successful completion of 4 years of the course, cadets will be granted Permanent Commission in the Army in the rank of Lt. Nationality: A candidate must either be : (i) A citizen of India, or (ii) A subject of Bhutan, or (iii) A subject of Nepal, or (iv) a Tibetan refugee who came over to India before the 01st of January 1962 with the intention of permanently settling in India or (v) a person of Indian origin who has migrated from Pakistan, Burma, Sri Lanka and East African countries of Kenya, Uganda, the United Republic of Tanzania, Zambia, Malawi, Zaire Ethiopia and Vietnam with the intention of permanently settling in India. Provided that a candidate belonging to categories (ii), (iii), (iv) and (v) above, shall be a person in whose favour a certificate of eligibility issued by Govt of India is necessary, may be admitted to the examination provisionally subject to the necessary certificate being given to him by the Govt. before declaration of result by SSB/joining training. The date of birth accepted by the office is that entered in the Matriculation or Secondary School Leaving certificate or in the certificate recognised by an Indian University as equivalent to Matriculation or in an extract from a Register of Matriculates maintained by a University which extract must be certified by the proper authority of the University or in the Higher Secondary or an equivalent exam certificate. Application will only be accepted online. To do so the candidate needs to click on the "online application" button on website www.joinindianarmy.nic.in. Candidates must enter their particulars in the online application. Eligible candidates may apply online at Indian Army's website (www.joinindianarmy.nic.in) from 29th Oct 2018 at 12:00 AM to 27th November 2018 till 12:00 AM. After Submission Online Application, print two copies of the online Application Form having the system generated Application Number. One copy of this Application Form is to be duly signed and mailed (posted) to Post Box No. 04, Nirman Bhawan PO, New Delhi-110011; along with the following documents: Self attested photograph, photo copies of 10th & 12th class pass certificates along with Marksheets, attested by gazetted officer.